This section provides a test on copying and pasting Chinese input text from UTF-8 and GB18030 Web pages to Big5 encoded Web forms. In this test, I wanted to see if IE allows me to copy and paste Chinese characters from UTF-8 and GB18030 Web pages to Big5 encoded Web forms. 1. Ran IE with this URL: http://localhost/Web-Form-Input-Chinese-Big5.php, and remove the default text from the input box. 2. 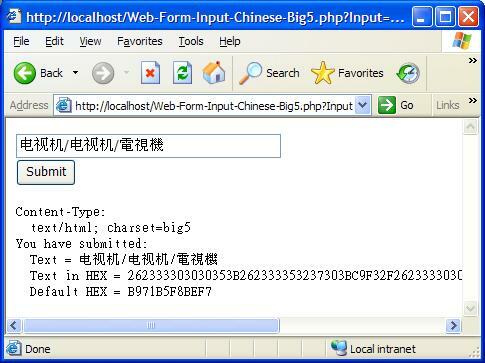 Ran another IE window with this URL: http://localhost/Web-Form-Input-Chinese-GB18030.php. Copy and paste the Chinese characters from this page to the input box of the Big5 page. Chinese characters show up in the input box correctly. 3. Entered a forward slash (/) in the input box of the GB18030 page. 4. Ran another IE window with this URL: http://localhost/Web-Form-Input-Chinese-UTF8.php. Copied and pasted the Chinese characters from this page to the input box of the Big5 page. The Chinese characters showed up in the input box correctly. 6. Clicked the Submit button on the Big5 page. The pasted characters were received and returned back to the returning Web page. The returned Chinese characters showed up correctly. This test shows that IE is smart, it automatically converts the pasted Chinese characters from UTF-8 and GB18030 encoding to Big5 encoding in a Web page form encoded as Big5.